All of the 23 en-suite rooms & suites at Hotel Villa Carlotta enjoy complimentary WiFi, DVD player, a minibar and international SKY channels. Complimentary water is supplied in all of the rooms which are air-conditioned. Extra beds for children can be added in some of the rooms. Eye-widening sea views can be enjoyed from large windows and the standing balcony. 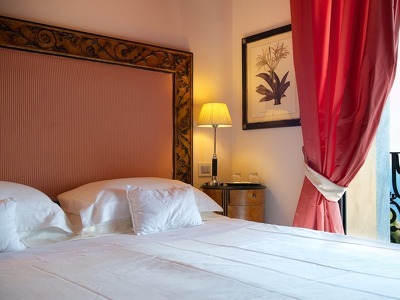 Each room, sleeping two, is decorated with gorgeous antique furnishings, as well as fine fabrics and Sicilian decor. A third bed is available on request. Rooms come with either a shower or bath. With absolutely stunning views of the garden from the shared balcony, this Junior Suite is rich in luxury. Expect fine fabrics, antique decor, and large windows that flood the room with light. The room also has international SKY TV, perfect for a chilled night in. Twin beds are also available, as is a third bed on request. Suites come with either a shower or bath, as well as tea and coffee facilities. All deluxe suites, sleeping two, are distinctive for their particular atmosphere and character. With gorgeous interiors, they are the perfect combination between the best Italian design and the traditional Sicilian style. Featuring a large bedroom, a living room and a luxurious bathroom, all suites come with a spacious private terrace. It is almost like an outdoor living room between the sea and the garden, with an outstanding sea view! Ideal for honeymooners or anniversaries, they are also fit for larger groups or families as they can fit 2 sofa beds. The suites have international Sky channels for you to use at your leisure. Featuring floor-to-ceiling Arab style windows overlooking the sea, this unique two-storey accommodation was recently appointed in April 2016. 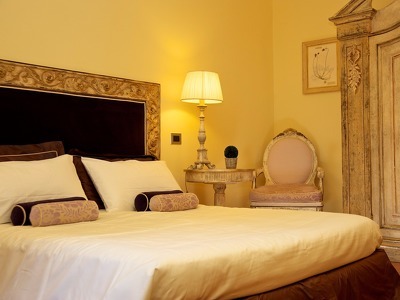 It has a large elegant living room on the ground floor, and an individually designed chic bedroom on the upper floor. There is a large Carrara marble bathroom with a separate walk-in shower. Guests can also make use of the international Sky channels. Sleeping two, this brand new accommodation offers a private sun terrace with armchairs and a sofa overlooking the tranquil garden and partially the sea. The chic interiors feature a light and airy living room, and a Carrara marble bathroom, which is like a private spa with walk-in shower, mosaic style bath tub, two marble wash basins and ETRO toiletries. Guests can also make use of the Sky international channels. Extra beds available on request. Located on the first level, this apartment is beautifully bright and thoughtfully designed in a contemporary Mediterranean chic style with your comfort in mind. Open the door to a generously sized lounge/dining area, with a standing balcony overlooking the sea. Guests can make use of the international Sky channels. The modern kitchen is fitted with premium appliances, and the individually designed bedroom includes one en-suite bathroom. A wide wardrobe area with washing-drying machine and iron board is just next to it. This apartment sleeps up to three people. Located on the second level, this luxury apartment offers a spacious ambiance, ideal for special occasions and families wanting to enjoy a comfortable stay in one of Taormina’s top locations. It is styled with contemporary Italian decor, inclusing rich wooden floors and Italian designer furniture pieces. The beautiful Living/Dining area opens onto a beautiful standing balcony overlooking the sea, where guests can make use of the international Sky channels, and iPod dock. There is also a modern kitchen fitted with premium appliances, including a Nespresso machine. 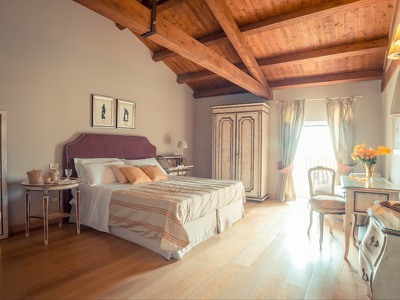 The apartment two features two bedrooms: the master bedroom features a generous armoire, en-suite Carrara marble bathroom with Jacuzzi power shots shower and Sicilian antique wood wash basin; the Junior elegant bedroom also has an en-suite. This apartment sleeps up to five people. Located on the top floor, this beautifully styled chic roof top apartment is decorated with exotic Sicilian ceramic floors. It offers a gorgeous panoramic private terrace overlooking over 100 km of Mediterranean sea and Mount Etna. The terrace is equipped with wrought iron ceramic table and chairs, sun loungers and a parasol for relaxing. Indoors, the exquisite bedroom features an en-suite individually designed bathroom, complete with an emotional shower. There is also a bright and spacious living room, and a kitchenette fitted with premium appliances. The “love nest” apartment has been designed to maximise light with windows both east and west, so guests can enjoy the celebrated Taormina sunrise or sunset or simply watch the stars. Expect international Sky channels, and a Nespresso machine among other facilities. It sleeps up to three people. “The Villa” is a brand new seafront spacious apartment, set in a 1700 Sicilian palazzo and surrounded by lush Mediterranean vegetation. Expect breathtaking views, and a tranquil atmosphere. It has an individually designed living room with Italian furnishings, international Sky channels, in addition to an incredible panoramic terrace. On the terrace you can relax by the wrought iron table, as you sit on the chairs or sun loungers. 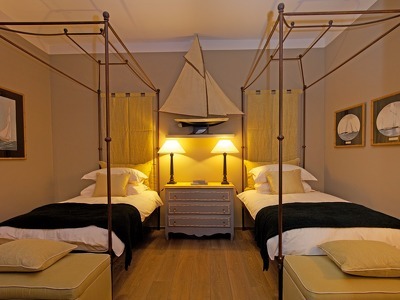 The apartment features two bedrooms: The Master bedroom and the Junior bedroom (note that the Junior has two four-poster twin beds that can be made into a king size). Each room has its own Italian marble bathroom, one with a walk-in shower. Close to the chic lounge, the modern kitchen is fitted with premium appliances, including a Nespresso coffee machine. The apartment sleeps up to four people and one child. Just 5 minutes from the main hotel, this three storey medieval palazzo is located in a prime position on the Taormina coastline. Guests are still able to use all of the facilities at the hotel. With vaulted ceilings and a 17th century Sicilian balcony with breathtaking views of Isola Bella and Taormina’s most beautiful beach, this villa is truly luxurious. It also features a dining area with seating for 8, a fully equipped kitchen, guest bathroom, laundry and store room. The villa also has a stunning panoramic terrace, under a pergola draped with jasmine and bougainvillea, with chairs, sofas and a cast-iron table. The antique stone staircase leads to the villa's medieval tower, with its large panoramic terrace revealing extraordinary landscapes and sea views onto the bay of Isola Bella. The Jacuzzi is ideal for secluded relaxation. There are three bedrooms, which are each individually designed with antiques and fine art curated from great collections around the world. 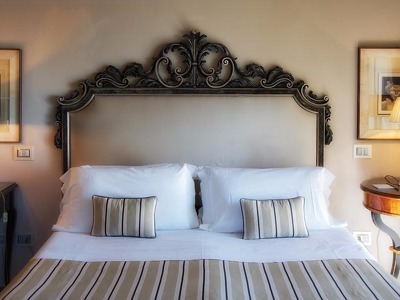 The custom-built beds are dressed in pure linen with a choice of pillows. Each bedroom has its own bathroom. Guests can also make use of the ILLY coffee machine, international Sky channels. "Al Teatro Greco Historic House"
From the secluded gardens, you have access to the living space with an extremely spacious lounge and dining area. The ground floor of the house features ample room for families or friends with its beautiful two bedrooms and amazing tall beamed ceiling. 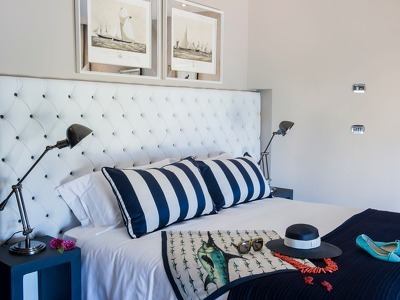 The master bedroom provides en suite bathroom, and overlooks leafy Mediterranean gardens, while the second bedroom is styled with chic and luxurious furnishings. The ground floor apartment has access to a large modern stylish kitchen with premium appliances and design tables and chairs. A beautiful door leads straight to a stunning and spacious terracotta tiled terrace with sun loungers, overlooking the lush Mediterranean garden below. Enjoy breakfasts with family and friends, seated at the magnificent Sicilian style ceramic stone table in the covered veranda. On the upper floor is the second apartment, which has a panoramic view of the sea, with access through a staircase (no elevator – porterage on site) . It sleeps up to six people and features two beamed ceiling bedrooms, the first of which has a view of the sea and overlooks the garden and the second faces the interior antique court, with Roman mosaic floors and an orange tree. A shared bathroom has a massive contemporary walk-in shower. The bright and comfortable living room is connected to a private terrace with a spectacular panoramic view, sun loungers, table and chairs. 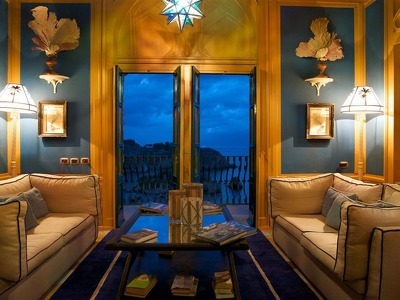 Hotel Villa Carlotta is a personal and sophisticated boutique hotel in Taormina, Sicily. 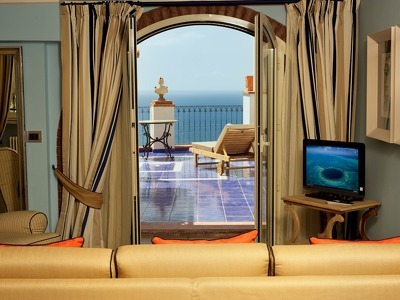 Expect sea views, with white sand and crystal blue waters, as well as breathtaking views of Mount Etna. 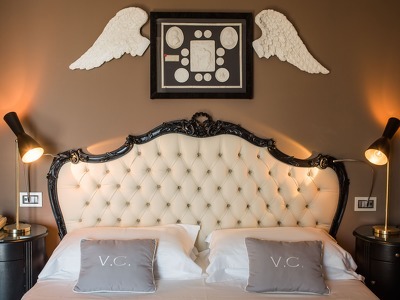 This Chic Retreat is perfect for relaxation and romance, and complements sister hotel Hotel Villa Ducale perfectly. In fact, they are two of Lulu's favourite Italian Chic Retreats. 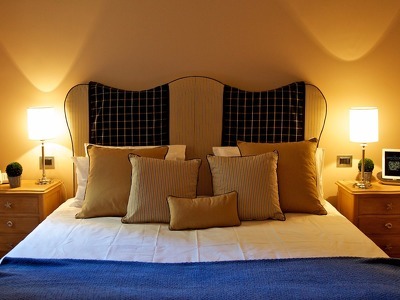 Villa Carlotta has four stunning apartments just a few steps from the hotel. It also has two luxury villas which are perfect for those wanting a bit more privacy and independence. The breakfast at Hotel Villa Carlotta is one of the best we've come across, and can be enjoyed while gazing out at the incredible views. Children are accepted. From November to March each year the hotel facilities such as the restaurant/breakfast, pool and garden will not be available for apartments. Reception will however remain open from Monday to Friday, from 09:00 until 17:00. With warm temperatures lasting as late as November, you can enjoy the pool throughout the year. Surrounded by a lush Mediterranean garden and offering stunning sea views, it's the perfect place to relax with a book. Taormina is full of fantastic places to visit, including Mount Etna, Syracuse, Giardini-Naxos, Piazza Armerina, as well as Catania market and its baroque centre. The Aeolian islands are excellent for a day trip (take a ferry from Milazzo), and the several Taormina beaches are a haven for tranquility and sunshine. There is a complimentary shuttle from the hotel to the nearby private beach where guests can then purchase a ticket to use the beach club services. You'll also have access to the nearby health club and there are tennis courts 5 minutes away. Hotel Villa Carlotta serves up delicious Sicilian dishes, including homemade pasta, risotto, salad and fish. The beautiful panoramic restaurant is one of the best restaurants in Taormina. For those who fancy something more casual, you can enjoy a light meal by the pool. Breakfast is a feast with many Sicilian specialities including homemade cakes and pastries, fruits, cereals, local hams, cheeses and Sicilian dishes (the caponata is a real treat!). Apartments and Villas are booked on a self catering basis. Appetisers are served at six, which we highly recommend. In the evening, there is a contemporary lounge bar where you can enjoy a cocktail or a glass of wine. The bar is set amidst Roman catacombs, creating a historical and authentic atmosphere. Elegance, refinement and stunning views all wrapped up in one beautiful package. In my view this hotel has the best breakfast in Taormina, it's a feast of homemade local delicacies and the panoramic views are breathtaking. The charming and passionate owners are hands on and their attention to detail is hard to beat. The cooking course is a must if you have the time. By road: From the A18 motorway take the Taormina exit. Once you reach the centre, turn left on Via Pirandello in front of the arch of “Porta Messina”, and drive down until number 81. Like most ancient towns, parking in Taormina is difficult, there will be space in the hotel car park (approx. 20 euro/day). By train: Nearest mainline station is Taormina-Giardini Naxos, approximately 5 km away. Taxis charge about 20 euro to Villa Carlotta. Catania airport is a 50 minute drive from the hotel (66km). Hourly INTERBUS coaches connect to Taormina bus terminal, 5 minutes walk from Villa Carlotta. Airport taxi fares are approx. 100 euro per car for two people. Transfers booked through the hotel are highly recommended. For the rooms, 15% deposit will be taken at the time of booking. For the apartments and villas, 30% non-refundable deposit will be taken at the timme of booking, and the balance must be paid 30 days prior to the arrival date. If a cancellation is made within 21 days of the arrival date, 50% of the total price will be charged. If a cancellation is made within 6 days of the arrival date, 100% of the total price will be charged. In case of no-show, modification/curtailment of stay from the arrival date onwards, 100% of the total price will be charged. If a cancellation is made at any time after booking, 30% of the total price will be charged. If a cancellation is made within 30 days of the arrival date, 100% of the total price will be charged. Small pets can be accommodated on request. Perfect for a very relaxing or romantic escape! The hotel complex offers everything you could expect for a carefree holiday and romantic escape- amazing location and views, most careful and pleasant team and service (making the impossible possible, taking time and excellent care for each individual guest), refined cuisine and liquors in a charming rooftop restaurant and bar. Overall, a very familiar and earthy atmosphere, which promotes the feeling of arriving in a real holiday home, with much care for the smallest details in a very tastefully designed environment. Waking up with flowers in the room, enjoying a first morning tea in bathrobe, with the amazing balcony views over the garden and the endless sea, joining a carefully prepared breakfast buffet with local and home made delicacies and exploring the fascinating shores and inland make it a truly memorable time with the desire to return over and over. Many appreciations and gratitude for a wonderful experience! Absolutely stunning views. Great staff and comfortable beds. One of the best places in Taormina to stay or to eat. If you search for a luxury combined with design & inspiration, fine dinning experience with a stellar chef, the stunning views, pool facilities, top service and stuff on the highest level of profesionality this place is just for you. I highly reccommend this place to everyone not conformed with average expectations. Went for dinner. Absolutely wonderful experience. Outstanding food, great service, and a breath-taking view. What a gem of a find. 4 years ago my travel agent recommended this hotel to me and my daughter. We have gone back every year since and will not stay anywhere else! Hotel Villa Carlotta has become like a second home to me and my family. The staff is incredibly helpful, friendly and truly concerned with making your stay memorable. They go above and beyond for each and every visitor. 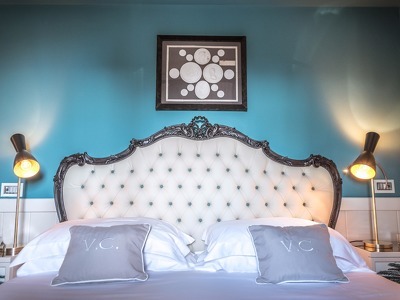 The rooms are exquisite and each one has its own breathtaking views of the gardens or sea. The hotel restaurant is truly amazing. Whether it is breakfast, lunch or dinner, the chef's are astounding and give you the most authentic Italian creations. Many thanks to Andrea Quartucci for creating a one of kind paradise! Looking forward to seeing everyone next summer!